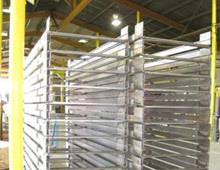 Spencer Fabrications utilizes its precision fabrication expertise, experience and technology to construct products in virtually any configuration and size. The steel assembly shown here was manufactured for an OEM customer. 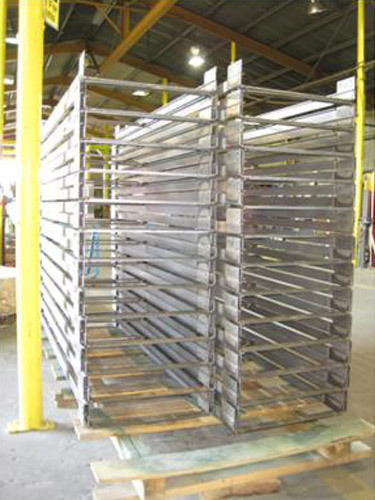 The primary processes applied to this assembly included laser cutting, bending, forming, welding, shearing and drilling, as well as complete assembly. The product featured a mill finish; however Spencer Fabrications also offers a range of custom coatings such as galvanized, anodized and textured powder-coat upon request. To meet the customer's specifications, we performed inspections, including first part and random sampling. For more information on this precision metal fabrication project, please see the table below. You may also contact us directly to learn more about our wide-ranging precision fabrication capabilities. Product Description These Assemblies were fabricated to an OEM's plans and specification. Overall Part Dimensions Length: 74.5"